TARGET 3001! 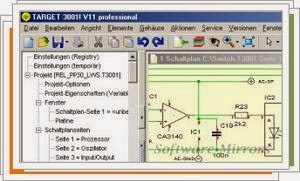 is a CAD-/CAE-software for PCB design made in Germany by IBF. It consists of schematic, simulation, layout, autorouter, 3D view and front panel design within one user interface. There are price calculators including ordering function for PCB and frontpanels. UNIQUE: Assembly Service from out the program! The external autorouter ELECTRA supplementary is embedded to every edition in a 250 pin-capable version. The complete project data are gathered in one single file. No conversion struggles and no version conflicts between schematic and layout. TARGET 3001! provides manufacturing data for production processes of all industry standards. You always get the complete system with the complete range of functions active. Free access to the component database. Free Updates within your main release number.